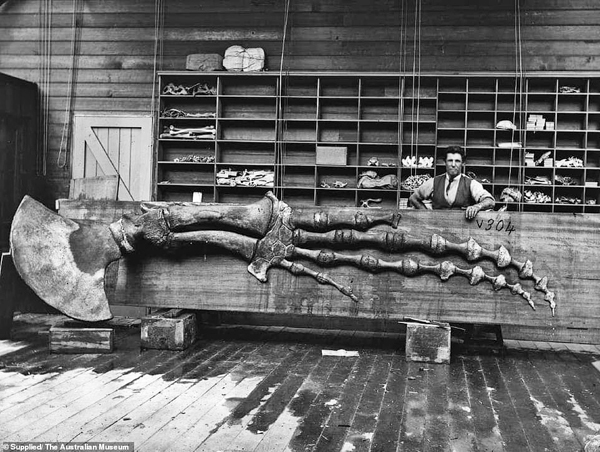 Henry Barnes’ brother Robert (who worked as the museum’s carpenter) poses with the skeleton flipper of a humpback whale. Incredible archived photographs which captured enormous marine life pulled from Sydney Harbour and surrounds will finally be shown to the public for the first time in 150 years. The new exhibition, Capturing Nature, showcases the incredible discoveries made by scientists working for the Australian Museum between the 1857 and 1893. The photographs showcase everything from the then newly-discovered marine animals such as manta rays to giant moon fish and the skeletons of whales. ‘Capturing Nature is not only a unique record of early Australian science but also brings to life the story of one of humankind’s greatest inventions (the camera),’ the museum said. 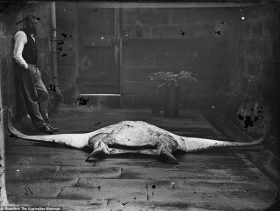 The collection of 15,000 photographs comes from glass plate negatives mainly taken captured by taxidermist Henry Barnes and his son, Henry Barnes Jnr, with the help of the museum’s curator Gerard Krefft. ‘Their photographs disseminated to the world the image of Australia and its fauna while also acting as a link in the awakening of the national consciousness during the early colonial days,’ exhibition curator Vanessa Finney said. Australian Museum Director Kim McKay said some of the earliest adopters of the new art form of photography were scientists. Ms Mckay said the scientists were quick to see potential in capturing the moments of these incredible animals for scientific purposes. She also said scientist Gerard Krefft crafted amazing skills with his experience and technology. Ms Finney said the glass plate negatives document the rapid expansion of the museum’s specimen collections in the 19th century and how each individual image was ‘painstaking to create’. 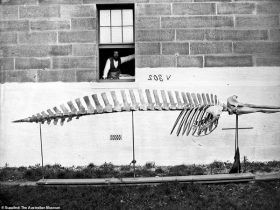 In a rare moment of whimsy, Gerard Krefft leans out of a gallery window above the newly prepared skeleton of a Beaked Whale. ‘They are a museum ‘rogues’ gallery’: dozens of animals captured, mugshot style, against a white-sheet backdrop,’ Ms Finney said. ‘The animals were first prepared and posed and then positioned for best natural light and least shadow. ‘Alongside the specimens, the figures of scientists can often be seen as a gauge of scale. Capturing Nature: Early Scientific Photography at the Australian Museum 1857-1893 opens on February 16 in Sydney.